Today is National Puppy Day! Today we spend a little more time celebrating the cuteness and joys that puppies bring us. It is also a day to raise awareness for puppies that need homes and to educate the public about puppy mills. 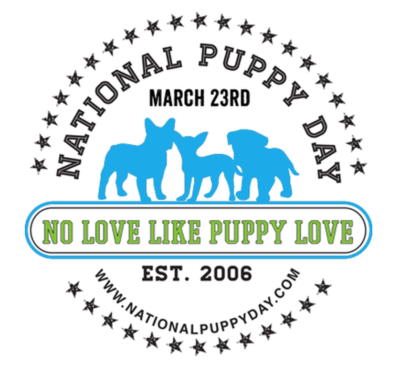 National Puppy Day was founded in 2006 by Colleen Paige, Celebrity Pet & Home Lifestyle Expert and Author. Since this day started it has become an international trend that works toward improving the lives of animals. Adopt a puppy from your local shelter, rescue or pure breed rescue organization. Write your Congressman and ask that he/she support the ban of Puppy Mi lls in your state. Assist an ill or elderly neighbor by walking their puppy. Have a puppy party and invite all your friends and their puppies! Host a community event to raise money for your local animal shelter. Buy your puppy a fun, new puppy toy. Give your puppy some fun exercise by taking him or her to puppy daycare. Throw out all your chemical cleaners and purchase non-toxic cleaners for your home to keep your puppy cancer-free! 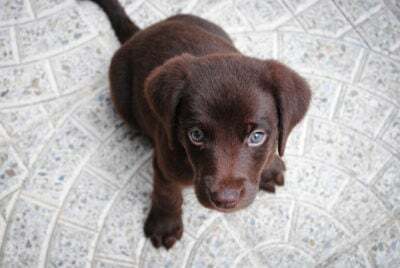 Puppy-proof your home and yard with a “puppy safe” inspection. Pledge to walk your puppy every day for proper health and behavior management. Pledge to never chain your puppy to a tree or doghouse. Always include your puppy in your family by letting them live inside the home with you. And last but not least – pledge to never yell at or hit your puppy…to be patient and kind and give your puppy lots of love and praise every day. Find more ways to celebrate here!